 The Rwanda Dairy Competitiveness Program II (RDCP) was estimated to have resulted in a strong decrease in the GHG emissions intensity of milk production, defined as the GHG emissions per unit (liter) of milk produced. Extensive cattle production systems reduced their GHG emission intensity by an estimated - 4.11 tCO2e per 1000 l of milk (-60%), while intensive production systems reduced their intensity by an estimated -1.7 tCO2e/1000 l (- 47%). The decrease in GHG emission intensity is evidence that RDCP made the value chain more efficient and sustainable in climate change mitigation terms.  RDCP’s productivity-oriented interventions increased livestock herd size and cow weight. As a consequence, total annual GHG emissions in the project area increased by an estimated 18,980 tCO2e due to increased herd size and 34,904 tCO2e due to increased cow weight, when compared to business-as-usual practices. This represents a 12 percent increase in GHG emissions.  The increase in milk output was proportionally much larger than the associated increase in GHG emissions. This increase in the efficiency of dairy production systems was the basis for a transformation to more sustainable production patterns in intensive and extensive dairy systems. Grewer U, Nash J, Bockel L, Galford G. 2016. 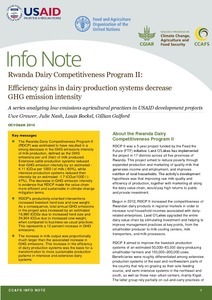 Rwanda Dairy Competitiveness Program II: Efficiency gains of dairy production systems strongly decrease GHG emission intensity. CCAFS Info Note. Copenhagen, Denmark: International Center for Tropical Agriculture (CIAT) and the Food and Agriculture Organization of the United Nations (FAO).